One of my favorite things about a con are the talent panels. I love, love, LOVE hearing the behind-the-scenes stories, inside jokes and learning what was really going on in this guy’s mind when this scene was shot. Jason Mewes was added to the roster of attendees kind of last minute and I was psyched I was able to get a good spot for his panel Saturday morning. 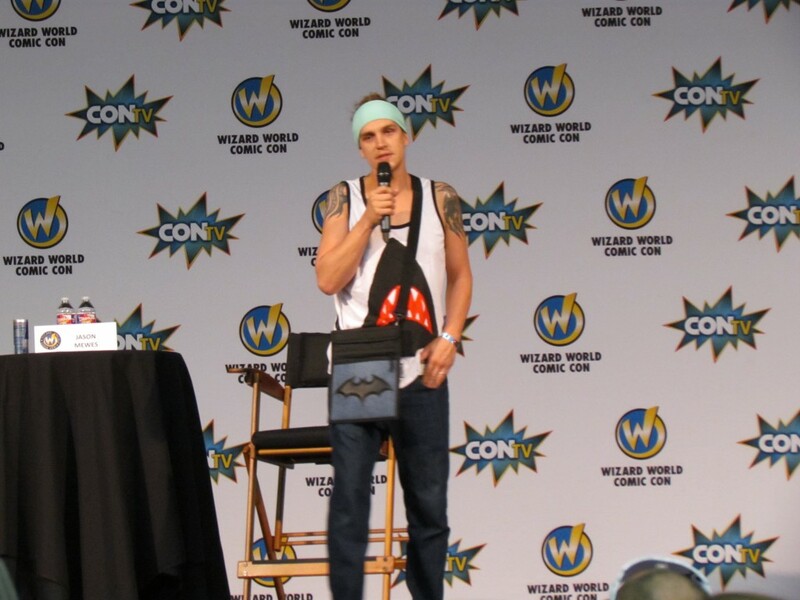 For those of you who aren’t aware how a panel can go, the celebrity, in this case – Jason Mewes, takes the stage and they either talk about things they have prepared or they go to the audience for a Q&A session. Me, being the dork I am, took heavy notes during this session so I can talk to you now about what went down. The first question took us to the status of ‘Mallrats 2′, he loves the script and they haven’t begun shooting yet. He and Kevin Smith haven’t had full Jay and Silent Bob costumes on since shooting ‘Clerks 2‘ and he’s beginning to wonder how old they can be and still get away with it. I think they can rock it as long as they want, but I’m a die-hard fan of the duo. 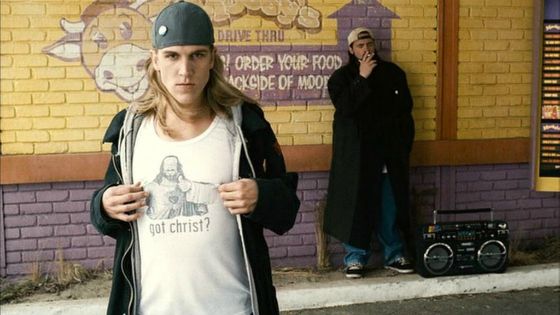 Mewes was asked about his favorite scenes and he explained that for him, having a bong-saber fight with Mark Hamill (‘Jay and Silent Bob Strike Back‘) was one of the most exciting things he’s ever done and that he tried to get the stunt moves down for the fight and couldn’t get the flip right. Another scene that stands out for him is being in the car with Leia (Carrie Fisher) in the same movie. He specifically remembers his joking becoming obnoxious to the point that Fisher got pissed at him. They parted on good terms and he’s since learned to gauge someone’s reaction to find out when to stop joking around so much. The question came up about his drug abuse and if he’d missed any roles because of that situation. He did lose out on one film, ‘Jersey Girl‘, directed by his buddy Smith. The part Jason Biggs ended up playing, Arthur Brickman, was originally written in for Mewes but Smith pulled it from him after the heroin abuse got in the way of his work. Another role Mewes is sure that would have come his way? ‘Batman‘ he cheekily replied. Asked about his sobriety Jay admitted that he is at 5 years, 3 months and 22 days sober which elicited a room full of applause, Mewes says his friendship with Smith is much closer than before because of the honesty about his drug abuse and that the podcast and traveling with Smith has come along as an after effect of it. On being asked what his favorite board games/card games are, he admitted that he has just started playing ‘Magic the Gathering‘ and that he’s always on the iPad app for it and can easily spend hundreds of dollars on the ‘Injustice: Gods Among Us‘ and Marvel’s ‘Future Fight‘, those are his main go-to games when he’s got down time. He plays Dungeons & Dragons, whichever version his buddy has on hand and they play as often as they can, but it’s usually every few months and that he’s been playing that since Jersey. He’s always up for a game of ‘Battleship‘ or ‘Chutes & Ladders‘ or ‘Stratego‘ and he’s asked about the ‘Cards Against Humanity‘ game a lot and it sounds like fun, maybe I can start my own version of Wil Wheaton’s and Felicia Day’s ‘Tabletop‘ and get Jay to play the game with me! He’s got some very specific thoughts on ‘Game of Thrones‘, or more particularly which house he’d be from and how he would die if he were on the show. He would be a Targaryan with the Night’s Watch and would die with Jon Snow’s balls in his mouth. It always goes back to balls with Jay. To end on that note, check out the video where he demonstrates what the Ewok Cockblock looks like. Bong! This entry was posted on Tuesday, October 27th, 2015 at 2:11 pm	and is filed under Comics, Events, News. You can follow any responses to this entry through the RSS 2.0 feed. You can skip to the end and leave a response. Pinging is currently not allowed.